the best place to shop in town is alexa roma (the main street). best get there in the morning as some shops shut at lunch and dont re-open. Plenty of shops for jewellery, gifts, clothes, shoes etc and the siade roads comign off also offer some lovely items. the people moaning clearly didnt find the main stree, pick up a map or ask the taxi driver drop you as close as he can. Plus if you go round august 24th then head into town for the st dennis' market (if u like crowds then go on the 24th but i warn you now they carry his body around the town). the market is always busy and is only there for 10 days around the 24th. Visit after that and they reduce everything to a few euros. Last year there was alot of house hold stuff but they sell clothes/underwear/socks/shoes/bags/make up/perfume/jewellery (and yes its sterling silver 925 she has lots of lovely stuff i highly recommend her)/food/animals etc. Am so gutted i wont be there this year as im going at the start of august instead. Hi, we stayed at tsillivi, which is a small bus ride away from zante town. We watched the procession on st dennis day, did go on abit and you get bitten alive by the local mosquitoes. But it was fancinating to watch a saint of over 4 hundred years old, hold so much respect, for the locals. I thought zakynthos was beautiful, the weather was way too hot for us though, but only because we are not used to it.. lol!!!!! highly recommend boat trips, as you see quite alot of the island, but we unfortunately only saw 2 turtles. would i go again? yeah.... depends what you want from your holiday. We wanted total relaxation, which we got. They do pester you a bit to come in there restaurants etc and drink coktails, but you only have to politely say no, the greek men are lovely!!!!!!!!!!!!! If you fancy a day off the beach, take the local bus inot Zante Town. 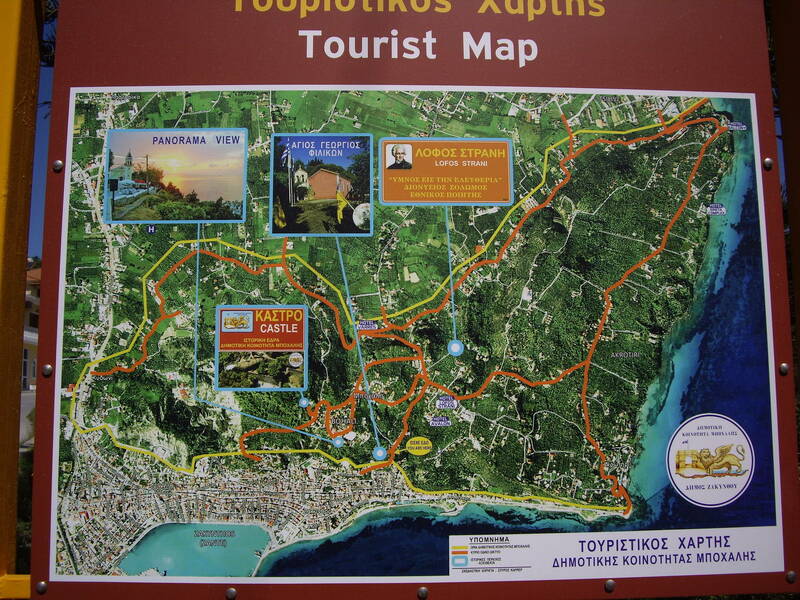 We took a day trip from Tsilivi, it cost 1 euro 40 each, and took about 20 minutes. Have a stroll along the harbour front, which is very scenic, and watch the boats and ferries come in and out. You'll find more designer shops than 'tourist' souvenir shops in the side streets. The Church of St Dennis is also well worth a visit, and is situated on the harbour front. Zante Town has a spanking new bus depot, set up on the hill, but don't worry, it's only a 5 minute walk to the harbour front. very nice place to visit, pretty little shops to the harbour.All very friendly in the little cafes. Driving around the town itself was hard work though!!! crazy drivers and parking very difficult, well worth the visit overall. We paid a visit to Zante town on the Friday night of our weeks stay! What a great decision it was! We got a taxi-which was 10 euros (I know how cheap!) and got dropped off near the shops. The shops were all pretty similar-however as Laganas has hardly NO perfume shops you may be pleased to know there were a couple here!!! We stopped off for dinner at a lovely place in the square! and as an extra bonus the Greek waiter was very nice to look at! Worth a visit. We took the little tourist train form argassi to get there, but its about 10 mins in the car. or you can get a bus if you wanna wait. Make sure you go either before 2 or after 6 if you want to go shopping, dont forget they have siesta! Alexandra Roma is the main shopping street in zante town. see pic. There are many bars restaurants and its very pretty. Solomon square and st marks square are lovely. St Dionysus church is worth a visit, the patron saints body is mummified in the church. Every year on the 24th august they take is body and parade him upright thourhg the town. Every so often they wil unveil his feet in the church (they dont tell the locals they are going to do this or it would be packed) lucky people will get to kiss his feet!!!!! hmmm they believe it will heal any ailments they have. very interesting and the church is stunning - all gold. caught local bus 1.10 euros. not many signs to show where things are . okay for coffee. would have been better if we had known what there was to do and where it was. Went in to Zante twice not much to do but nice in the evenings with the locals about .Had to go in to visit a jewellers we went to last year called platinum.I bought my wife diamond earings and necklace.He told us then that if we came back in the future and wanted better diamonds he would exchange them and deduct the price we originally paid against the new items ,He kept his word unfortunately for my wallet. We've been to Zante many times and visited Zante town at least once on each visit. There is the occassional begger ( I also saw a woman with a tiny baby in 2004). It is sad that they use their children in this way, but don't let it ruin your holiday. We bought a pack of biscuits for a small boy but that was all. There are very few people calling you into their restaurant or cafe in Zante town. Most of the places have far more locals in them that brits! We have had many lunches in Zante town and I have nothing bad to say about any of them. We got married in Zante town hall (not the prettiest of buildings lol) and so spent a lot of time there. The best memory I have was of a group of about 15 local old men singing in one of the cafes at about 11am one morning, all slighty tipsy i think. It was amazing and such a lovely feeling to hear them sing without a care in the world. There are lots of shops in Zante town and plenty of museums too. There are some posh shops and some cheap shops. There as some posh cafes and some regular ones - if you don't want to spend loads then check the menu before you order. Have a look around and remember you're not in a cosmopoliton city, but a small town. Zante town is a beautiful place to visit, the locals are very friendly and the two main squares are a fantastic place to spend an evening. I think many people forget it is the islands main town and not there to cater for tourists. Visiting Zakynthos town will give you a taste of real Greece. By the way they do not try to pull you into the restaurants and you dont have to watch your purse. Christ most of the people that holiday in Zante come from up north. Liverpool-Newcastle-Nottingam etc etc. Your telling me this areas worst than those get a grip. The food was excellent, too much money? put your hand in your pocket and spend your on holiday and stop moaning. I met one english woman at the waterpark she said its not very big (its not bad) is it to her son, we will find a bigger one in Cyprus next year, with locals standing all around us. If she wasnt happy go home. What is it with people, the shops are ok priced theres a good variety, but thats the euro for you. Some people never seem satisfied whether at home or abroad. Dont beleive the comments people put on this page if they are knocking Zante Town. anywhere. Thw best time to go is after 6.00 as most of the main shops open at this time until 10.00pm. with local families and couples. It was a very relaxed atmosphere. This is not on the main front but the road behind. There is also a big square with three big outside coffee bars. We also went to the St Dennis festival. Which included fireworks, a fair and big market (went back three times).There were alot of street stalls and people which made for a great night. He is the saint of the Island, and has been dead some 130-150 years. They carry him around in a gold plated box with a big parade. This is a great place to visit. We went on an evening coach trip on a friday night and enjoyed it, Lovely atmosphere, old people not scared to come out like they are here! Very child friiendly. Lovely shops and cheap costume jewellry stalls. Two chemists if you need one, I did! Here are some recent photos of zante town that were taken 3 weeks ago! We went to Grecos bar, awesom, one of the best bars on the island, gorgeous bar maid and great service! 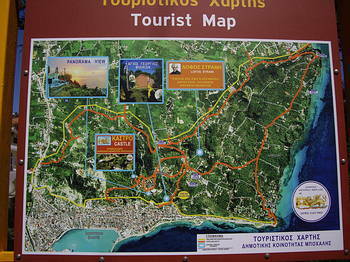 Went there via a public bus from Kalamaki - quick journey. It was nice to be out in the traditional town and away from the tourist bits. Climbed up a hill and got some great views. Had a look at the harbour and got more great pics. Once looked round the same old shops not much left to do however. We took the bus to Zante Town via bus service one morning. A total waste of time. Too much hustle and bustle and everywhere you walked you had to avoid cars and motor bikes. (Not exactly making this a nice stroll around the town). Couldn't stay around waitng for the bus trip back that afternoon so took a taxi. The taxi driver was so short he had to keep shuffling to the front of his seat to see over steering wheel. A very scary ride back to Alykanas and cost 15 Euro. Loved our holiday but would never go into Zante Town again! !